I believe that this is the "His Exelency". 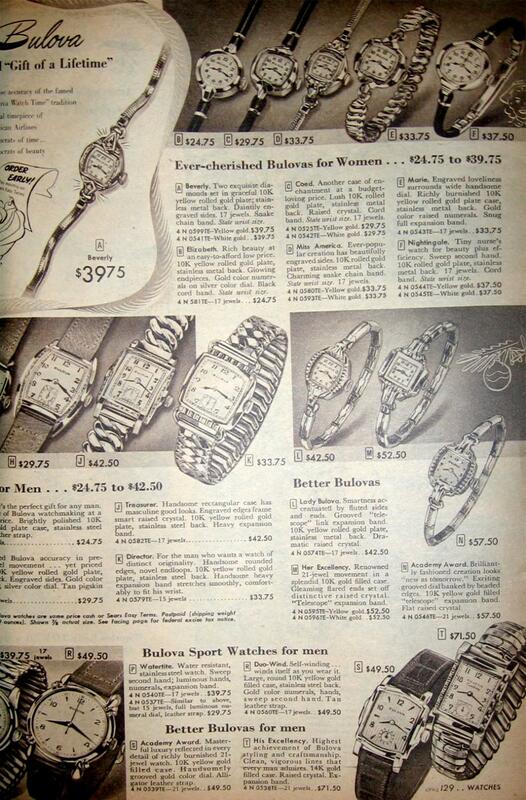 The ad section doesn't show one from 1951 but the 1950 ad in the lower right corner seems to match. Dial doesn't look to be corrent with the case. Yellow cases should have a silver/white dial. True, but with the gilt hands, it looks to me like the face is discolored and that it was probably white originally. RobW, can you please provide some additional information on your watch. This would help to confirm it ID as a 'His Excellency'. The Dial is the correct sort. Not sure if the redish color is on the dial or just the reflection. Looks like the 5 bump His Excellency in the ad to me. Dial numbers are an exact match (only difference ad dial shows Excellency under the BULOVA logo). I own a 1953 five bump His Excellency with an X dial and same number font style as the ad above. It's in the database. A confuson factor with this watch is that it appears in a group of seven Academy Award watches in a color picture that was passed around awhile ago. However, I have never seen an ad supporting the center watch as an Academy Award watch. RobW is your case engraved? This Watch is the 'HIS EXCELLENCY' as shown in the ad with an original White Dial showing age patina. The reddish/pink hues We are seeing on the Dial are are a result of a slightly warm overexposure in the photograph, I've had this happen. I strongly urge this Watch be removed from 'UNKNOWN' status to ID'd as 'HIS EXCELLENCY' - there should be no debate on this one. I'm with Fifth on this one as well. What is the movement jewel count?